Erin Blegen: My Scrap Cabin: Final Scrap FX Reveal for August!! Hi everyone! I truly cannot believe that August is almost at an end...I know everyone is saying that...but seriously. Can't believe it. This time of year I definitely find myself rushing out the door as often as I can- hopping on the 4-wheeler, taking the kids out, soaking up the last of the summer while I can. Just two nights ago, Josh and I took the kids out to the gravel pit near our house at about 7 PM as it was just a gorgeous night. My two boys were racing each other around the pit and as I was taking a little video, it struck me that just a year ago I took the boys out to the same pit, during this same week, and the weather was just as it was the other night...perfect. It was a sentimental evening as the next day I would be leaving to go and stay with my sister to wait to go into labor with Aspen. And a week from today, she was born. It was strange to think how much my boys have grown in that time...and a bit sad. But a good sad, I guess...:). And today, I have a layout and a card to share with you- the layout features photos of my younger son Gunner, exploring this same gravel pit a couple of months back. I have a lot of memories of this place- going back to when I was about 13 years old when we moved to this part of the county. I remember when I was about the age of 15 and my sister (Kelly Foster) and I would take my mom's 1985 E-350 van (which I often called the "cardboard box") out to this same pit. I was new to my driving permit- and so this was even more fun to do! We'd put in an old Willie Nelson tape, throw on the orange hunting vest and hats that were in the van, and just go tearing down the muddy, pot-hole filled road (more like a trail, lol) and whip donuts in the poor old van. Sure was a blast. To be honest, I was at first really unsure about not only mixing a sepia photo with a color photo, but also about using a color photo with bright orange in it, lol. But in the end, I enjoyed the contrast and think it worked out okay :). There’s just no competition for the titles available from Scrap FX! I’m sure I say it every time, but I just LOVE them. Here I’ve used my finger to unevenly coat my title with gesso before applying a sandy shade of ink to blend with my layout. 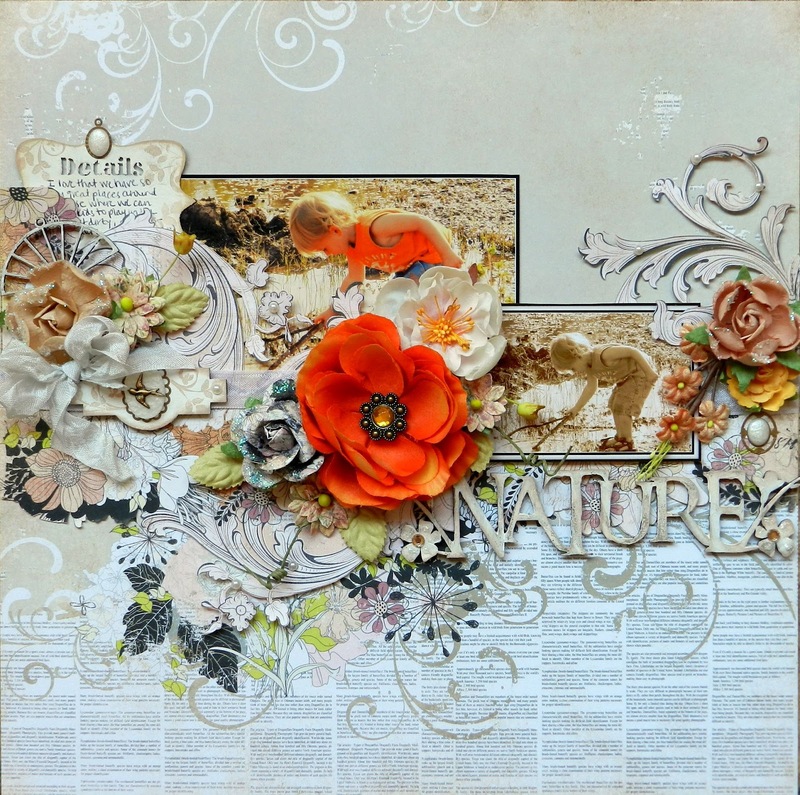 I’ve also added Stickles and bling to the flowers on this beautiful “Nature” title. I’ve created a pretty little embellishment out of this piece from the “Railway Station Pack“. 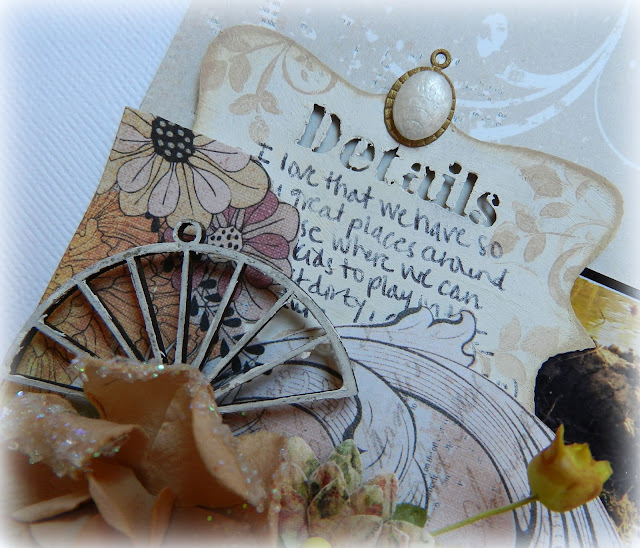 After painting with gesso, I stamped the flourish vine and added this pretty little cameo. 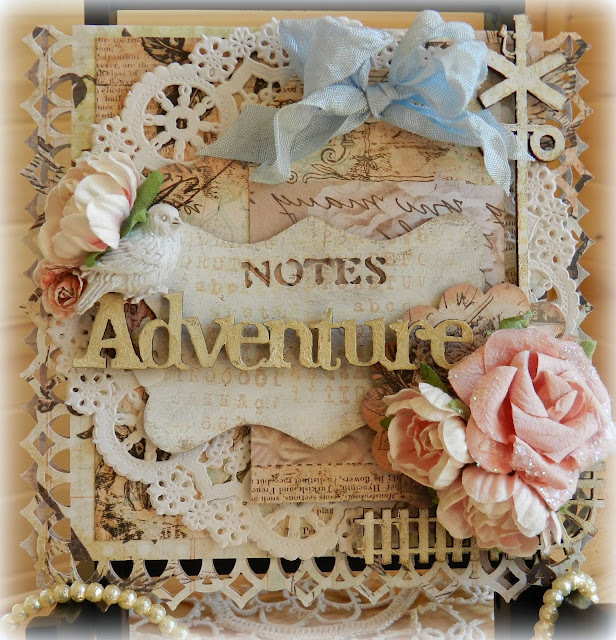 I wrote my journaling on this pretty new journaling tag pack, “Journal Notes KRAFT“. I’ve again painted it with gesso, inked and stamped along the edges, and added a small cameo as a pull tab. 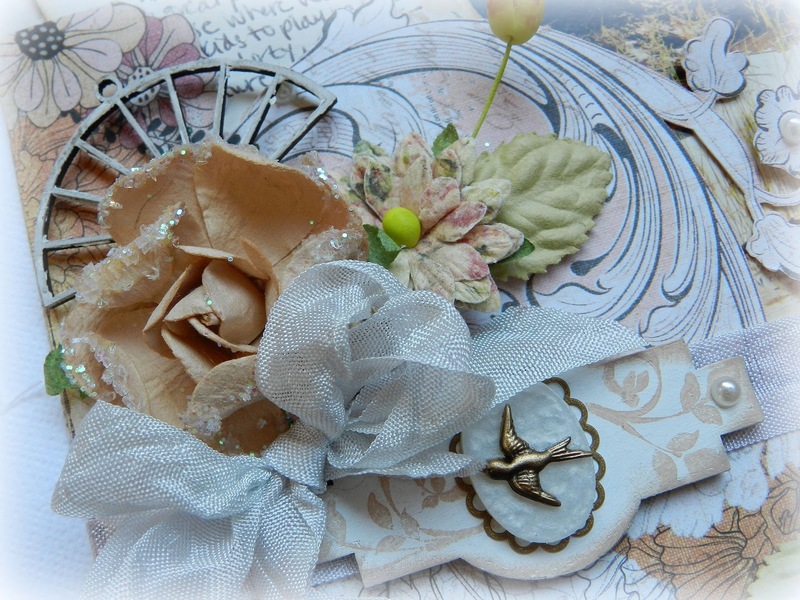 I’ve also used the little fan out of the “Asian Embellishments” pack to add interest to my cluster. Prima Marketing Chalk Fluid Edger Pad "Dry Sand"
I have to say- this card went together rather quickly and I think it's my favorite card to date. I was just having "one of those days"- where everything just seemed to fall into place! 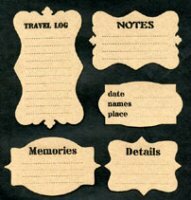 I love small titles like this one, from the “Camping Wordlet Theme Pack“. They’re perfectly suited for a card. The railroad track and sign are from the “Railway Station Pack“- perfect little additions to support a travel-themed card. And finally, another tag from the “Journal Notes KRAFT” pack adds the perfect backdrop for my title. 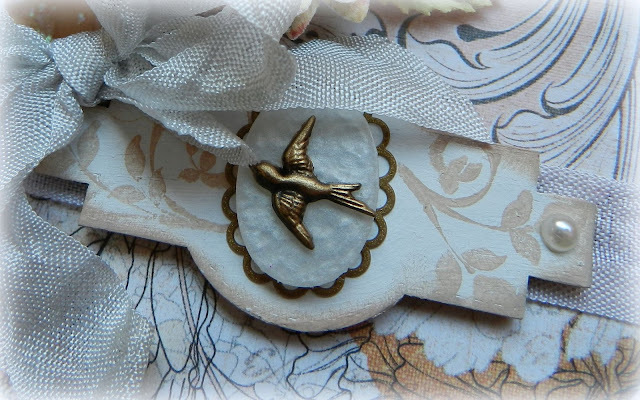 All pieces have been painted with gesso, inked and stamped for a beautiful coordinating piece. 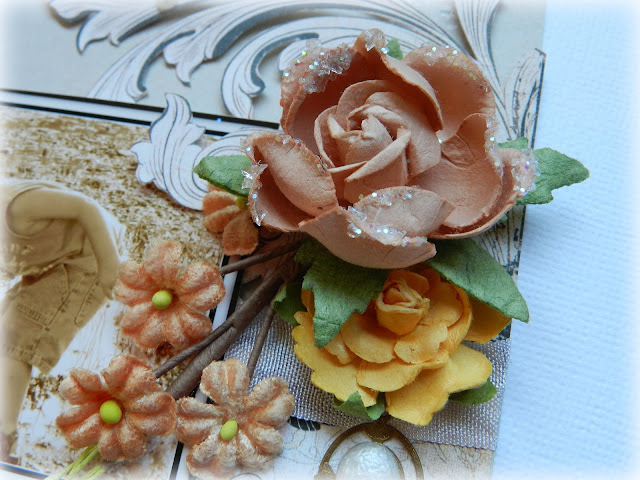 Prima Marketing Chalk Fluid Edger Pad "Dry Sand" & "Shabby Tote"
Martha Stewart Border Punch "Garden Rail"
Wow! That got to be quite a post- thanks for sticking around for the whole thing. I know it's a lot to look at, but I do love that you look :). And that wraps up the month of August at Scrap FX! As always, I like to direct you to my FAQs tab at the top of my blog, where you can find a list of online stores currently carrying Scrap FX products. I do try to have a look around at least once a month and add to the list- more and more stores are picking up these amazing products- NO surprise ;)!! I hope you've had a great start to your week...I'll be seeing you soon, take care!! Oh wow. This has to be my new fave of yours. I just love mix of colour photo and sepia and the orange flower just POPS. Gorgeousness all over. WOW WOW det er barte et helt fantastisk lo du har lavet. jeg er vild med den måde du har lagt kontraster ind. tak for inspiration. wow, Erin, your layout is absolutely gorgeous! love it! Wow, that lay-out is so amazing! I really love the addition of the orange flower - such a perfect little accent. Your tag looks totally fab too! 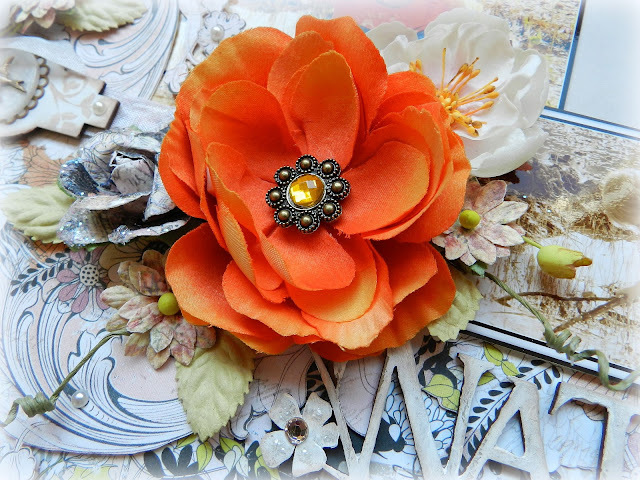 Love the 2 snaps together & that pop of orange with the flower is sensational...your card is amazing. Wish mine turned out like this!!!!! Love the bright orange in theLO. I really like the card, happy to hear it came together so quickly. HI.. I had a giggle at your post about your driving and doing donuts!hehe, that is what old cars are for!! I did the same when I was young!! and your layout looks amazing.. I love the gorgeous orange flower.. and the card looks fabulous too.. I hope you have a great week! wow! Both of these are just absolutely gorgeous! WOW I just love the layout! Totally stunning Erin!! And a lovely pretty card too!!! Really gorgeous layout Erin!! I love that pretty Orange flower right next to your photos, because it definitely draws your eye to the cute pics!! Wow! I just love the layout and the card! They are gorgeous! Thanks so much for the inspiration. This is quite possibly my favorite page of yours, ever..don't know what it is, but it's just perfection!! Love the card, too, of course!! Ух, ты!!! Какая страничка интересная! Сколько деталек!!! И открытка очень понравилась!! !